Summary: The purpose of this research activity is to continue to characterize the population of marine turtles that utilize the nearshore hard bottom reefs in Brevard County, FL, including determining their genetic origin through the collaborative efforts with the University of Georgia (P.I., Brian Shamblin). Target species are green (Chelonia mydas) and loggerhead (Caretta caretta) sea turtles. Turtles are captured using tangle net, dip net or hand-capture methods. Marine turtles will be tagged (externally and internally), measured, weighed, and photographed each year. Foraging samples will be obtained from 35 juvenile green turtles using an esophageal flushing technique. A small biopsy or blood sample will taken from juvenile green turtles and use to determine their nesting beach origin. This is part of a larger collaborative study with other researchers currently collecting data from juvenile green turtles in coastal and estuarine waters off the east coast of Florida. Our study area is located in the intertidal and subtidal areas between PAFB (latitude 28o 13.8 N, longitude 80o 35.9 W) and Indialantic (latitude 28o 6.18 N, longitude 80o 34.06 W). None of the juvenile green turtles captured in the past 5 years (n=50) have displayed signs of fibropapillomatosis (FP). Results: Altogether, fourteen trips to the study area for netting and visual transect surveys of marine turtles were conducted in 2009 and 2010. During five visual transect surveys a combined total of 52 juvenile green turtles were sighted. On one of the trips, visibility exceeded 1.5 m and 38 turtles were sighted during that one survey. A total of 21 turtles were captured during netting sessions. Morphometric data, photographs, and foraging and biopsy samples for genetic analysis were collected from 19 turtles. Two turtles went to rehabilitation facilities to be treated for existing injuries. Up until the capture of one of the injured turtles in June 2010, no FP (fibropapilloma) tumors had been observed on any of the turtles captured in the study area since netting activities began in 2004. 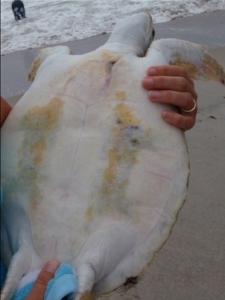 The tumor on this turtle was located around damaged head scutes and necrotic tissue at the site of an injury. Both of the turtles with injuries successfully recovered at their rehabilitation facilities (Marine Science Center and Gumbo Limbo) and genetic samples were obtained prior to their release. According to genetic stock analysis results conducted on samples from 15 turtles (B. Shamblin, U of GA), turtles were from 3 geographically different stocks.